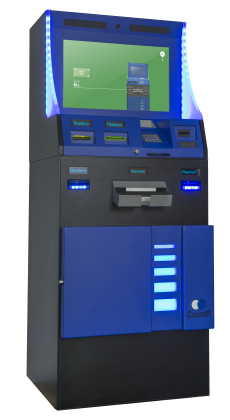 CashIO is our product family of self-service redemption kiosks for casinos and route gaming. Longwaiting time at cashiers and downtimes at slot machines reduce revenue and customer satisfaction. CashIO optimizes pay in and pay out processes and therefore reduces cost. Better service to the customers increases customer satisfaction and playing time. CashIO validates the tickets with the casino online system and pays the respective amount to the customer. The customer does not have to see a cashier and can do the entire payout by himself. CashIO can redeem player cards to customers. The customer can initially charge and recharge the player card at the CashIO as well as decide to receive a full or partial payout. CashIO can also manage deposits for player cards. CashIO features up to 4 coin hopper and 6 banknote cassettes (depending on the edition) and guarantees exact payout, down to the last cent. This reduces waiting time for the machine to be refilled. 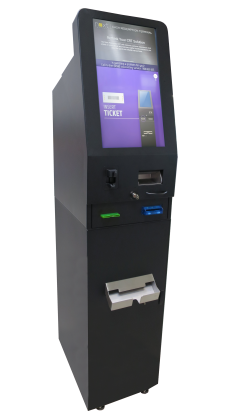 CashIO Platinum and Titanium can dispense and accept magnet, chip, as well as RFID cards. Casino employees and service personnel can also choose between magnet, chip or RFID cards to use as authorization cards. CashIO can also be used to break down notes into smaller denominations. The parameters for this can be individually set by the casino staff. CashIO greatly simplifies the jackpot payout in the casino. The casino staff can get a list of all valid jackpot payouts directly from the CashIO terminal and then pay the customer. There is no need to go to a cashier, therefore this quicker method helps to further increase customer satisfaction. 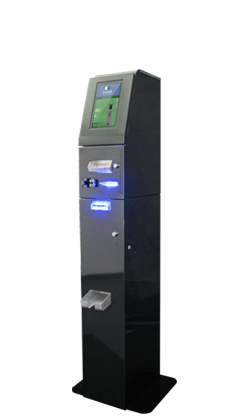 CashIO Platinum and Titanium offers all hardware components to be used as an ATM. 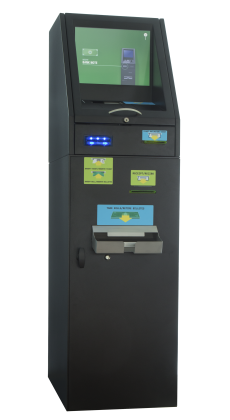 ATM-only-machines are no longer necessary on the casino floor, therefore saving both space and customer waiting time. All banknotes are secured by a safe in the CashIO, which is fitted with a mechanical lock. CashIO Platinum and Titanium can be fitted with an optional electronic lock. The CashIO terminal documents all transactions, e.g. cash paid out, cash paid in, cash refills, and also records events such as door unlocked, staff login etc. This data can be accessed at any point in the form of report summaries.